With no jump racing this afternoon and little prospect of any for the next few days, horse racing punters were still out in force today placing ante post bets on the Cheltenham Festival. Coral reported a number of horses being backed, with Denman and Master Minded both cut for their Cheltenham targets after one high staking telephone punter placed a substantial bet on the pair at 2-1 and 13-8 respectively. 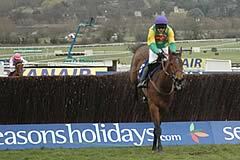 Coral now offer 7-4 Denman from 2-1 for the Gold Cup and 6-4 from 13-8 Master Minded for the Champion Chase. Captain Cee Bee continued to be popular for the Arkle Tophy today and Coral cut him to 5-1 joint favourite for the race a position he shares with Sizing Europe. In the Champion Hurdle the reigning champion was well backed today forcing Coral to cut him to 10-1 from 12-1 to retain his crown. "With just the one domestic fixture at Wolverhampton it has been very quiet in our shops today, but surprisingly it has been one of our busiest days of ante post betting we have had since the start of the Jump season," said Simon Clare, Coral Spokesman.